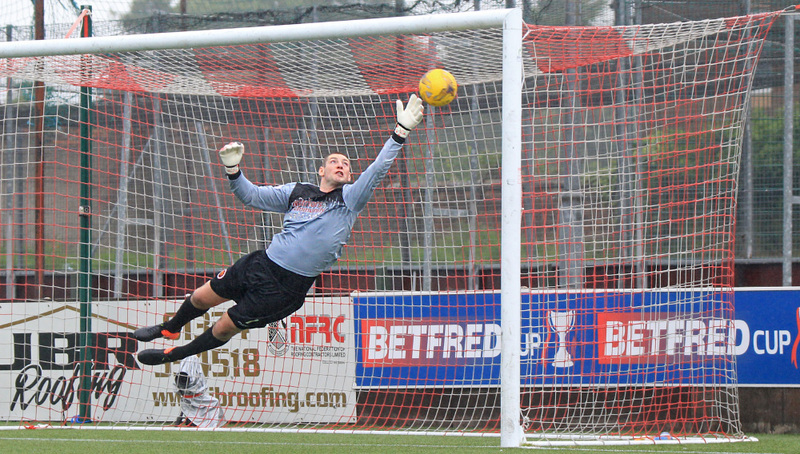 Queens came from behind to overhaul League Two side Stenhousemuir 3-1 at Ochilview Park. 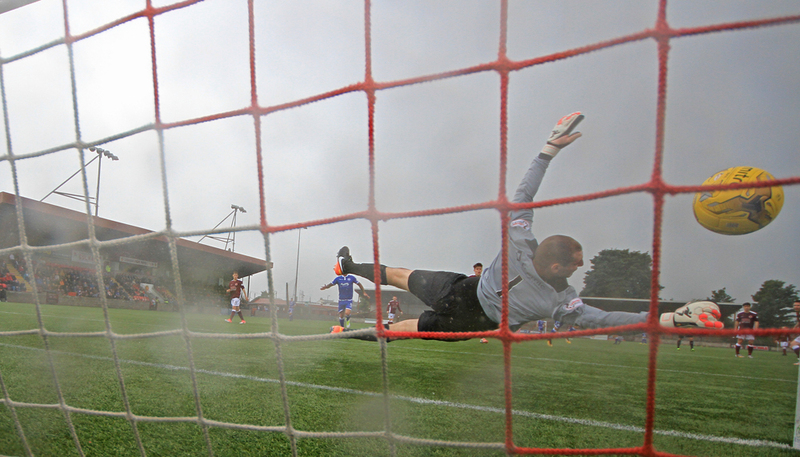 The Doonhamers went behind early doors courtesy of Mark McGuigan`s spot-kick. 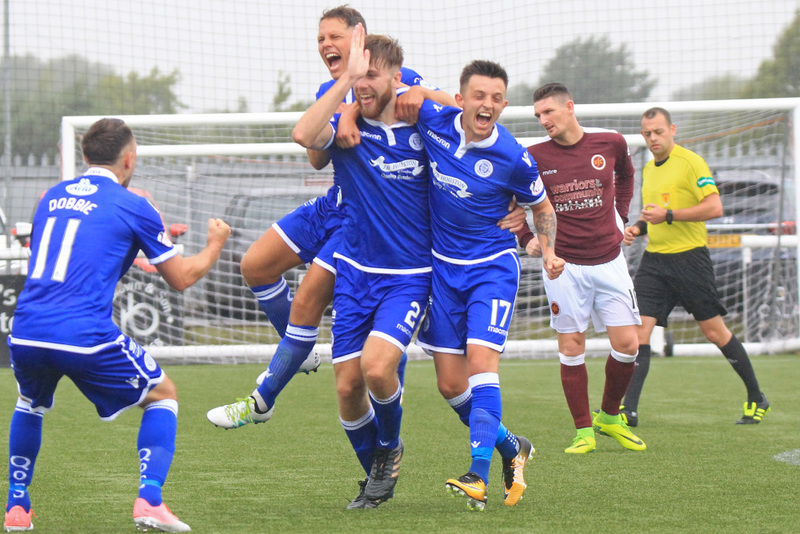 Three goals in the final 20 minutes, a brace from Stephen Dobbie and a bullet header from Shaun Rooney, helped Queens breath a sigh of relief in their opening Betfred Cup group tie. Queens and Stenhousemuir played each other two teams last season. 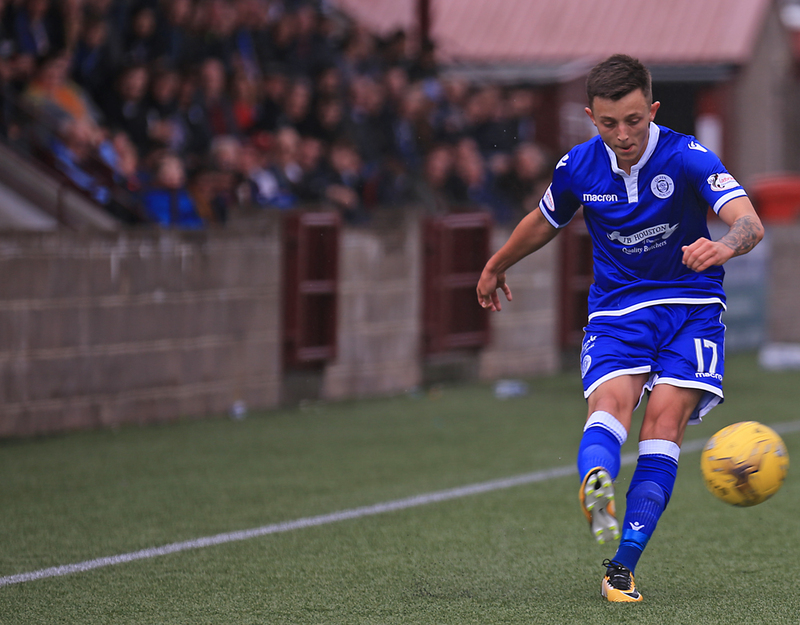 Queens won both encounters, 1-0 in the Betfred Cup and 7-1 in the Irn Bru Cup, at Palmerston but this was the Doonhamers` first visit to Ochilview since 2013 when the Warriors won 2-1, one of only two defeats for Queens in that league campaign. Gary Naysmith handed competitive debuts to goalkeeper Alan Martin, defenders Shaun Rooney and Callum Fordyce and midfielder Andy Stirling. Derek Lyle had to settle for place on the bench. In the Warrior`s rank was former Queen`s Park striker Jamie Longworth. The teams came out to WWE wrestler, Stone Cold Steve Austin`s entrance music and the first piece of action wouldn`t look out of place in a ring. Lyndon Dykes was progressing up the pitch and Stenny midfielder Ruaridh Donaldson made a crunching tackle that looked like a certain foul. However, nothing was given as the ball fell to Stirling but he couldn`t mark a perfect debut and curled an effort from the edge of the box wide of the target. The Championship side were on top in the early stages and should`ve pounced on a defensive blunder to go ahead. A slack back pass from Ross Dunlop was intercepted by Dykes 18 yards out. The Australian squared the ball to his strike partner Dobbie but Dobs failed to get a shot away as Stenny goalkeeper Chris Smith raced off his line to clear the danger. Despite the early pressure from the visitors it would be Brown Fergusson`s side who would take a shock lead. After nice build-up Martin Scott found space in the box but before he could get his effort away was bundled over by Queens new-boy Rooney giving referee Gavin Duncan little choice but to point to the spot. Former Stranraer striker Mark McGuigan stepped up and made no mistake with the resulting penalty kick to mark a dream debut for the forward. 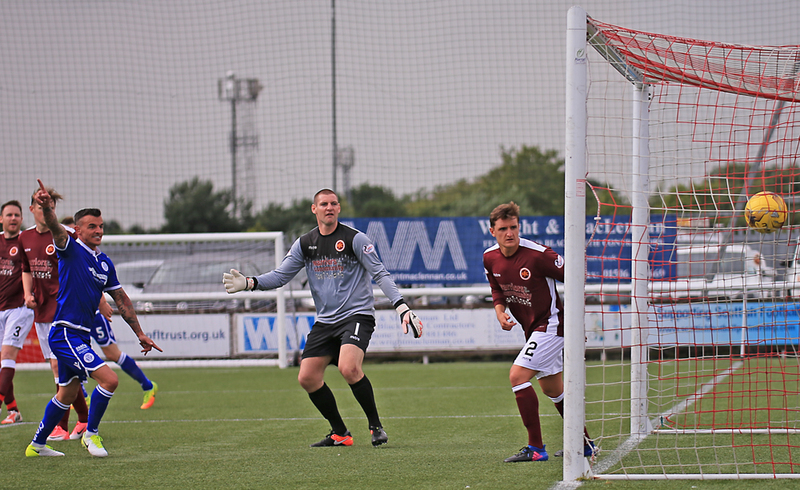 Queens huffed and puffed but couldn`t open up spaces across the Stenhousemuir defence. It would be the hosts who created the next chance as Longworth and McGuigan linked up but before the striker could pull the trigger Callum Tapping made a last ditch tackle. It would Tapping again in the battles, this time at the other end and on the receiving end. The Englishmen was brought down 20 yards from goal. Both Dobbie and John Rankin lined up to take the free-kick, it was the former who smashed a fierce effort goal wards but was denied by the palm of Smith. The hosts had the final chance of the opening period but Donaldson skied a free-kick from 20 yards. The Doonhamers nearly levelled the match on 47 minutes when Rooney hit a low powerful cross from the right but fellow newbie Stirling just couldn`t get that all-important touch and trickled out for a goal-kick. The tide was turning slowly and the full-time team was beginning to find extra space in between the Stenhousemuir final third. The introduction of striker Derek Lyle, on for Tapping, on the hour mark was showed Naysmith`s intent of finding an equaliser as soon as possible. Six minutes later youngster Connor Murray replaced Dykes that meant the deadly partnership of Lyle and Dobbie would lead the line for the remainder of the cup tie. It proved to be inspired substitutions from Naysmith as the Doonhamers finally levelled the match on 69 minutes. Murray`s deep corner was flapped away by the unconvinced Smith. The ball dropped to Dobbie and his high deflected effort spun into the top right hand corner. It now seemed it was a matter if Queens could find a winner and came close through Dobbie`s long range free-kick but Smith was on hand to deny him his second. The men in blue would move ahead on 85 minutes and this time it wasn`t a familiar goalscorer. Queens earned a free-kick when Kyle Jacobs was mowed down by Ross Gilmour. Dobbie stepped a swung a perfect cross from the right into the box which Rooney connected with and leaped the ball into the top corner. Rooney, who only scored one goal last season with York City, celebrated with the architect whilst the Queens supporters chanted the right-back`s name. 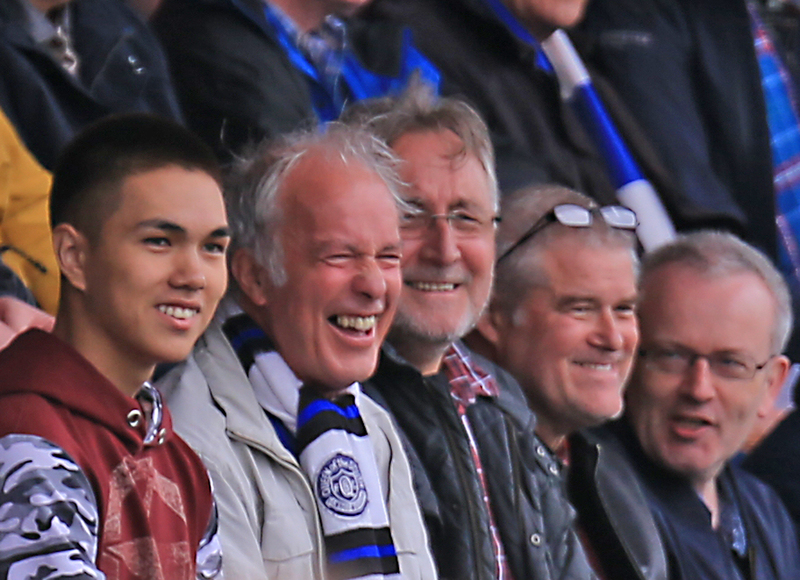 Two minutes later, Dobbie scored his second of the afternoon and Queens` third in fabulous fashion. The striker gathered the ball from 22-yards out and did what he does best, place a low effort past the keeper and round-off the victory for his side. Little action was to be had after the goal, only young Jesse Akubuine replaced Stirling to made his debut with a minute left on the clock. It wasn`t a pretty or convincing win for Queens but they managed to get over the line against their inferior opponents and are joint top of the group, Hamilton top via alphabetical order. The Doonhamers host Lowland League champions East Kilbride on Tuesday evening with a 7:45pm kick-off at Palmerston Park. 14:14 Something different not difficult!! 15:01 The teams come out to WWE wrestler Stone Cold Steve Austin`s music and we`re only moments from kick-off. No holds barred. 2 min After a meaty challenge on Dykes the ball falls to Stirling and curls an effort wide of goal. 5 min Keeping with the wrestling themes, McGuigan takes a low blow from a Marshall clearance. 7 min Dykes intercepts a slack back pass, lays the ball to Dobbie but is tackled by the oncoming Stenny show stopper. 11 min Marshall`s ball is hit out for a corner kick. 15 min Penalty to Stenhousemuir. 17 min Rooney brings down Scott and McGuigan steps up and makes no mistake with the resulting spot-kick. 26 min Longworth looks to have broke through the Queens defence but Tapping makes a last ditch tackle and the ball ends up in Martin`s arms. 29 min Stirling`s cross is hit out for a corner. 31 min Tapping brought down in a dangerous position, Mr Dobbie to step up. 31 min Dobbie`s fierce free-kick is palmed over the bar by Smith for a corner. 45 min Donaldson fires a free-kick over the bar. Half Time Simply not good enough in the first 45 minutes of the season. Queens go in 1-0 down through a McGuigan penalty. Half Time The players are back out for the second half. Mon the South. 54 min Queens upping the pressure, Rooney earns a corner kick. 59 min Rooney fouls Scott and referee Gavin Duncan pulls the right-back aside for a chat. No caution. 70 min A deep corner from Murray, Smith flaps the ball, ball drops to Dobbie and his deflected efforts spins into the top right corner. 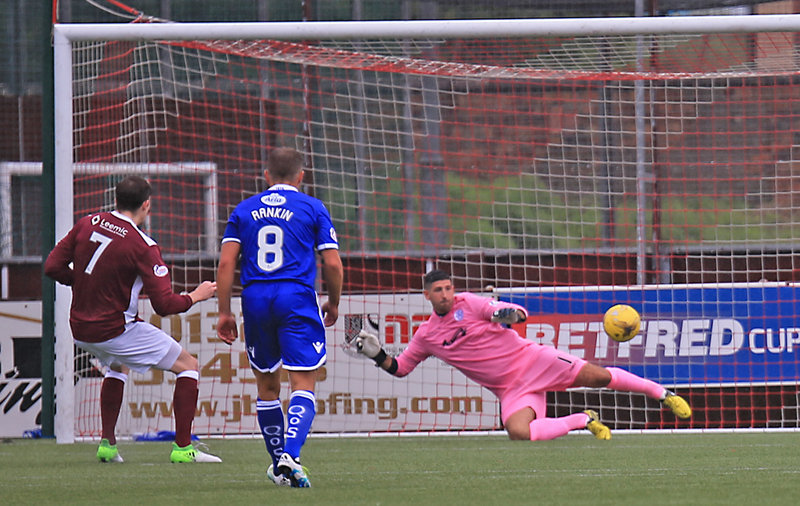 75 min Dobbie`s long range free-kick is deflected out for a corner kick. 75 min Dobbie`s shot has no pace and trickles wide. 77 min Dobbie lines up another free-kick but Smith catches the ball. Still 1-1 but Queens look most likely. 82 min Queens win a free-kick Gilmour fouls Jacobs. 83 min Dobbie`s free-kick is headed home by Rooney. Chants of Rooney, Rooney, Rooney. Get in. 85 min What a strike from Dobbie from 25-yards rifles it into the bottom corner. Mon the south.